Mrs. Goldstein ties her tichel on Shabbos the way her mother always did. Her son Yankie explains that she should not tie or untie her tichel this way since it is a double knot. Must Mrs. Goldstein tie her tichel differently? And may she untie the knot that is holding the tichel on her head? Yankie’s older brother, Reuven, returns from yeshivah and tells his mom that it is okay to tie the baby’s shoes with a double knot. Mom has never done this, always assuming that one cannot tie a double knot on Shabbos, even though baby Rivka’s shoes almost never stay tied on Shabbos as a result. Of course, Yankie does not miss the opportunity to disagree with Reuven and emphasize that one may not tie the shoes on Shabbos just as one may not tie the tichel. She calls the Rav, who begins to explain…. As we see, these and many other shailos in regards to knots affect our weekly observance of Shabbos. We must learn these halachos thoroughly to be certain that we are keeping Shabbos correctly. Tying and untying knots are two of the 39 melachos prohibited on Shabbos. Several types of knots were tied in the course of constructing the mishkan, which is our source for what is forbidden on Shabbos. For example, it was necessary to tie and untie the nets used to catch the chilazon that provided the techeiles dye. Also, the weavers of the mishkan curtains had to tie knots whenever a thread tore (Gemara Shabbos 74b). The Mishnah and Gemara teach that some knots are prohibited min haTorah, others are prohibited midirabbanan, while others are completely permitted. They also state that any knot that may not be tied may not be untied either. If tying it involves a Torah prohibition, then untying it is forbidden min haTorah (Mishnah Shabbos 111b). If tying the knot is only midirabbanan, then untying it is midirabbanan. If one is allowed to tie a particular knot, one may also untie it (Rambam Hilchos Shabbos 10:7). Although several examples of prohibited and permitted knots are mentioned in the Mishnah and Gemara, exactly what defines a “prohibited knot” is never discussed. This issue is left for the Rishonim to discuss, who have two approaches to define the issue, that of Rashi and that of the Rif. Rashi and most Rishonim contend that it is prohibited min haTorah to tie a permanent knot, it is prohibited midirabbanan to tie a semi-permanent knot, and that it is permitted to tie a temporary knot. But where does one splice between a prohibited semi-permanent knot and a temporary knot that is permitted? Although there are different opinions concerning this, everyone agrees that Rashi permits tying any knot that will be untied within 24 hours from when it is tied (Beis Yosef 317). A knot of such short duration is considered temporary and is permitted (Mishnah Berurah 317:6, quoting Pri Megadim). On the other hand, everyone agrees that Rashi forbids tying a knot that remains for a week or more. This is long enough to be considered semi-permanent and tying it on Shabbos was prohibited by Chazal. What Poskim dispute is whether Rashi permits tying a knot meant to last more than 24 hours but less than a week, some viewing this knot as semi-permanent and others viewing it as temporary (Rama 317:1). One may follow the lenient opinion under extenuating circumstances (Biyur Halacha 317:4 s.v. she’einam kevuim). Thus, according to Rashi, tying two lengths of jump rope together to make a longer jump rope may be prohibited min haTorah since one might leave the knot permanently. Tying a knot attaching a boat to a pier is prohibited midirabbanan since it may be left for a long period of time. It is not prohibited min haTorah since it will definitely be untied eventually (Gemara Shabbos 111b with Rashi). One may tie shoes since they will be untied later the same day. (It should be noted that one may not put a new shoelace into a shoe on Shabbos because it is considered completing a vessel, see Magen Avraham 317:7). The Rif and Rambam present a different approach why one may tie some knots on Shabbos but not others. In their opinion, a knot that is permanent is prohibited min haTorah only when it is a type of knot that a craftsman would tie, called a “kesher uman.” A permanent knot that would not be used by a craftsman is only midirabbanan. In addition, a knot that a craftsman would tie but is not permanent is also only midirabbanan, whereas a knot that is neither permanent nor used by a craftsman is totally permitted. In the Rif’s opinion, there is no intermediate category for semi-permanent knots. According to most interpretations, he considers any non-permanent knot as temporary even if it remains tied for a long time. Thus, tying a knot and leaving it for several months will be permitted so long as it is not a craftsman’s knot according to these interpretations of the Rif’s opinion (Pri Megadim; Aruch HaShulchan 317:3; Avnei Nezer #178; Mishnah Berurah 317:5; However, compare Taz 317:1 and Graz 317:2). Furthermore, according to this approach, tying a craftsman’s knot with intent to untie it after several months will only be midirabbanan according to the Rif because it isn’t permanent. Here are some examples of knots that are prohibited min haTorah. 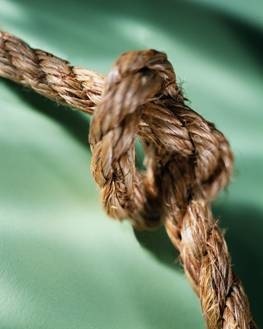 In the time of the Mishnah, boatmen would tie a knot at the prow of a boat or ship that was never removed. Such a knot is prohibited min haTorah on Shabbos. According to Rashi, this is because the knot is permanent while according to the Rif it is only forbidden min HaTorah because of the additional factor that it is tied by trained boatmen. Similarly, knots tied by shoemakers or sandal makers of Talmudic times were prohibited min haTorah (Gemara Shabbos 112a), since they were tied permanently (and according to the Rif because they were also craftsmans’ knots). Tying knots of tefillin and tzitzis is a Torah violation since these are craftsman’s knots and permanent (Gemara Eruvin 96b; Shabbos 131a). Tightening the knots of one’s tzitzis may also violate a Torah prohibition. Suturing stitches is prohibited min HaTorah because the knot tied after each stitch is a permanent skilled knot (Nimla Tal Kosheir #16). Therefore, whenever possible, a non-Jew should perform this suturing on Shabbos (see Rama 328:12). According to both Rashi and the Rif, one may tie a knot that will be untied within 24 hours. Thus according to all opinions, one may tie a gartel on Shabbos or the belt on a bathrobe or any other garment that is usually untied when the garment is removed. Similarly, a woman may tie her tichel in place because a woman always unties this knot when she removes it so that she does not dishevel her hair. MAY I KNOT THIS KNOT? In conclusion, there are three disputes between Rashi and the Rif. 1. According to Rashi, a permanent knot is prohibited min HaTorah even if it isn’t a craftman’s knot, since permanence is the only criterion for the Torah’s prohibition. However, the Rif will consider such a knot to be prohibited only midirabbanan if it is not a craftsman’s knot. We should note that a knot that will never be untied is considered permanent even if one does not need the knot anymore. Rashi explains that the knot used to bind the aravos and hadasim to the lulav is considered permanent since one never bothers to untie it. This is true even though this knot will not be needed for more than a few days and then the lulav will be discarded. Thus, knotting a bag of garbage on Shabbos violates a Torah prohibition according to Rashi since the knot will never be untied (see Rashi Sukkah 33b), whereas according to the Rif it is only midirabbanan unless one used a craftsman’s knot. 2. We mentioned that tying a semi-permanent non-craftsman’s knot is prohibited according to Rashi, but permitted according to the Rif. Therefore, Rashi would prohibit tying a plastic bag with a simple single knot that is meant to last for more than a week (and possibly even for more than a day) since this knot is semi-permanent although it is certainly not a craftsman’s knot. The Rif would permit this since it is neither a craftsman’s knot nor a permanent knot. However, we should note that the exact definition of a “craftsman’s knot” is uncertain. Because of this question, some poskim rule that one should not tie any knot very tightly even though one intends to untie it shortly (Shiltei HaGibborim). 3. A temporary craftsman’s knot is prohibited according to the Rif, albeit only midirabbanan, but is permitted according to Rashi (who considers a craftsman’s knot no different from any other knot). Thus, securing a rope in order to rappel down a hill is prohibited midirabbanan according to the Rif since one would certainly use a craftsman’s knot for this purpose. Rashi permits tying this knot if one intends to untie it after a few hours. Most poskim rule that we should be stringent like both opinions (Rama 317:1). Therefore, one may not tie a craftsman’s knot even if it is temporary (even though Rashi permits this), and it is also prohibited to tie a semi-permanent knot even if it is not a craftsman’s knot (and would be permitted according to the Rif). Therefore, one may not knot a bag closed with a semi-permanent knot, nor may one tie a craftsman’s knot even for a few hours’ use. Under extenuating circumstances, one may tie or untie a temporary knot even though it qualifies as a craftsman’s knot and rely on Rashi, or tie a non-permanent knot that is not a craftsman’s knot and rely on the Rif (Maamar Mordechai; see Avnei Nezer #178:6). In both of these situations the dispute is only whether tying the knot involves an issur dirabbanan. Although we usually rule stringently, as explained above, in an extenuating situation one may rely on the lenient opinion. We have learned that one may not tie a permanent or semi-permanent knot or a craftsman’s knot, and also that one may not tie one tight knot on top of another. For the remainder of this discussion, see Knotty Situations II. Previous Previous post: Could the Fruit on My Tree Be Arlah?